CBS has been incredibly good about marketing its new series Under the Dome, giving fans an idea about what to expect from the summer drama. If you’ve caught the trailer, or any of the other sneak peeks at the series, you’ve seen violence and havoc wreaking a small town. In the series, one of America’s small and faltering towns is interrupted from regular life one day when a giant dome comes out of nowhere and snugly and firmly isolates the town from the outside word.The advertising for the series largely draws on the pilot episode, and if any of trailers piqued your interest, you should enjoy the premiere. Small town dramas have always found a niche within the TV realm. From Gilmore Girls to period dramas like Dr. Quinn, Medicine Woman, the intrigue of a place where everyone knows one another and is in each other’s business frequently gives viewers a warm and nostalgic view into small town America. Under the Dome, on the other hand, takes this notion and spins it on its head, presenting circumstances that allow for a faster pace and plenty of action, as well as a world that’s brimming with betrayal, seediness, and secrets. When the dome finds firm footing over the town of Chester’s Mill, we begin to see the true mettle of characters we’ve only just met. There’s Sheriff (Jeff Fahey) and deputy Linda (Natalie Martinez), the former who is more concerned with keeping the town afloat than upholding the law and the latter who is eager to please but in a little bit over her head. There’s Barbie (Mike Vogel), who is just passing through but also harboring a secret and Junior Rennie (Alexander Koch), who may be a true psychopath. Then, there’s Big Jim Rennie (Dean Norris), a seemingly nice guy with hints of a much darker side. The premiere spends precious moments building the backstories of each of its characters, but despite this, the episode is gripping and surprisingly violent. While cable and, especially, subscription cable has often been a glut of blood and gore, we’ve seen an increase of violence on network television in recent years, with programs like The Following and Hannibal taking the grotesque to new bounds for primetime TV. A science fiction premise allows for all manner of gruesomeness, and with a dome appearing, causing accidents and rending flesh, fans will be privy to plenty of shiver-inducing moments involving humans and even cows in the first episode. Developed by Lost's Brian K. Vaughan, Under The Dome is based on the novel of the same name by Stephen King, and while I haven’t yet sat down to read the book, the show offers the same careful storytelling crafting and the same quips we’ve come to associate with King. Purists of the novel may note differences between the show and the book, but invariably some changes will have to be made to fit a TV format, and the important thing is that the tone of the show is distinctly King-ly. Into the first episode, the show doesn’t offer the most sound or interesting science fiction premise on television right now. Nor does it offer the most unique characters we’ve ever seen on television (it is CBS, after all). Still, the show does offer a surprisingly strong and action-oriented pilot that should have fans questioning where Under the Dome is going and who will survive into the finale. Many pilots are clunky and filled with exposition, whereas Under The Dome is engaging from the moment the title sequence ends and a dead body appears on the screen. 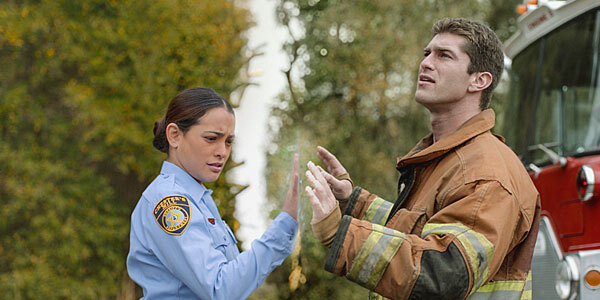 CBS' Under the Dome isn’t set to officially premiere until Monday, June 24 at 10 p.m. ET, but a little under a month ago there was already talk that the “event series” could go beyond a first season, and thus, King’s book. We still have a while to wait and see if that’s a viable premise, but at the end of the day, CBS’ new series is worth a watch and maybe even a repeat view. UPDATE! Under the Dome has now turned into a big ratings success for CBS. So as you'd expect, they've renewed it for a second season. What's more the season 2 premiere will be written by Stephen King.